Too Much for the Spirits is a letter written by Arthur Conan Doyle first published in the Daily Express No. 6669 on 30 august 1921. Sir, — Mr. Stuart Cumberland's good natured banter does not really touch the spot. There is no mystery at all about the Grosvenor, and her position is known to an inch. Her deck has already been explored. 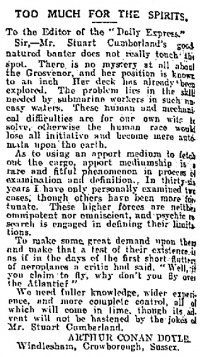 The problem lies in the skill needed by submarine workers in such uneasy waters. These human and mechanical difficulties are for our own wits to solve, otherwise the human race would lose all initiative and become mere automata upon the earth. As to using an apport medium to fetch out the cargo, apport mediumship is a rare and fitful phenomenon in process of examination and definition. In thirty-six years I have only personally examined two cases, though others have been more fortunate. These higher forces are neither omnipotent nor omniscient, and psychic research is engaged in defining their limitations. To make some great demand upon them and make that a test of their existence is as if in the days of the first short flutters of aeroplasms a critic had said: "Well, if you claim to fly, why don't you fly over the Atlantic." We need fuller knowledge, wider experience, and more complete control, all of which will come in lime, though its advent will not be hastened by the jokes of Mr. Stuart Cumberland. This page was last edited on 19 July 2016, at 13:45.